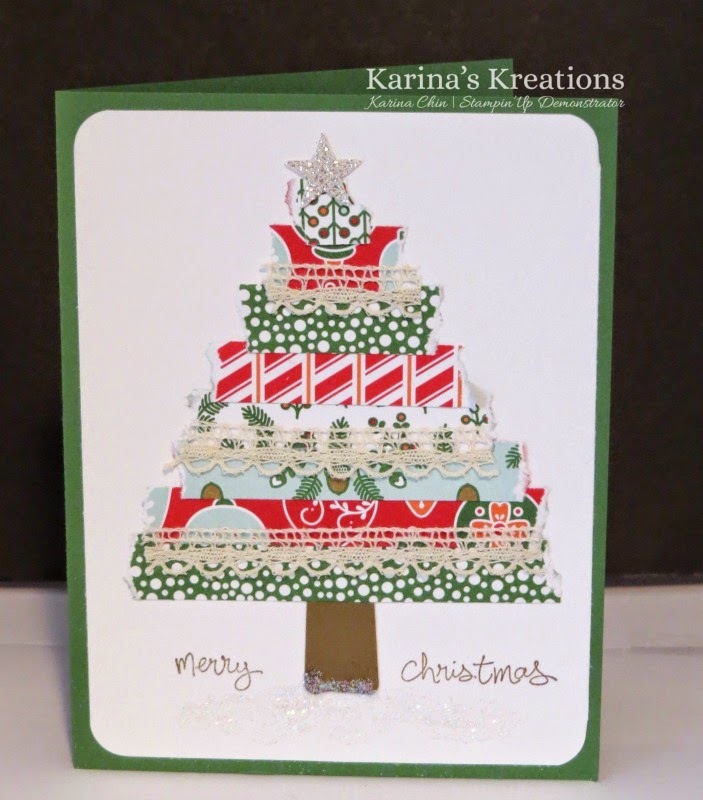 Karina's Kreations: Punch Art Tree! Only 2 more days until Christmas!! I made a punch art tree using strips of 1/2" Nordic Noel Designer Series Paper to make my cute Christmas Tree. Isn't it cute? 1. Stamp snowflakes with versamark ink on the Blue snowflake 10-1/2” x 12” Designer Series Paper. Emboss with Silver embossing powder. 2. Attach to the canvas with Mod Podge. 3. Tear a piece of 3” x 10-1/2”Whisper White card stock in half creating jagged edges to look like snow. Set it aside. 4. Place a 1-1/2” x 3” Soft Suede card stock to the canvas with Mod Podge. Cover the edge of the tree stump with the Whisper White card stock. Use Mod Podge to adhere the Whisper White card stock. 4. Paint the edge of the Designer paper with White Acrylic craft paint. 5. Cut the Designer Series Paper into 1” by 6” strips. You need 10 strips in total. 6. Tear the edges of the Dp strips. 7. Start at the bottom of the tree and work your way up using Mod Podge to attach the strips. 8. At the treetop, attach a real star and Silver Glimmer paper star cut out with the Stars framelits. 9. Cut the Venetian Crochet Ribbon into three pieces, lining up with the Designer Paper strips. Attach with Mod Podge. 10. Thread Cherry Cobbler Baker’s Twine through the Nordic Designer buttons and attach to the tree with glue dots. Use at least 7 buttons. 11. Cut “Joy” and “Noel” with Real Red card stock and the Wonderful Wreath Framelits. Make sure you place wax paper in between your card stock and the framelits die. Otherwise, your card stock will get stuck in the framelit die. Attach to the project with Mod Podge. 12. Cut out presents from the Designer Series Paper and attach to the project with Mod Podge.